When a large commercial building has a fire that affects the inside of the heating and cooling duct system, you need to take immediate action. If the commercial air duct system is not cleaned or cleaned properly any contaminant that may have been introduced to the HVAC system could continue to blow out into the conditioned space. In Cabelas case in Dundee Michigan, they had a small fire that affected the commercial air duct system and vents. When looking for an air duct cleaning company to resolve their problem, they found Amistee Air Duct Cleaning. 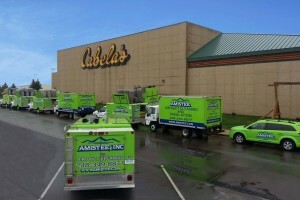 Amistee was able to clean the entire buildings air duct system and get the store on the road to recovery. As the energy costs rise from local providers (DTE, Consumers), many of us homeowners cringe when we open our monthly bill. According to the US Department of Energy, heating and cooling costs account for about 56% of the energy use in the typical US home. This is factually the largest energy expense for most homes in Michigan. Air Duct Cleaning in Michigan can help with this cost. Homeowners can either accept this fact or try and make changes to their homes and personal lifestyle to reduce energy costs and their carbon footprint. One large thing a homeowner can do to increase energy efficiency in the home is to get the heating and cooling (HVAC) system cleaned. Having the HVAC system cleaned can increase the efficiency by up to 30%. The National Air Duct Cleaners Association suggest to clean your system every 3-5 years. Things like pets, children, pollen, dust or renovation can drastically affect how clean or dirty your homes duct system may be. Amistee can come inspect and or clean your homes air ducts to help reduce the energy consumption and reduce your monthly bills. Call Amistee today at 248-349-8877 for the service of air duct cleaning in Metro Detroit. You may also CLICK HERE for a direct link to our request page. Air Duct Cleaning in Michigan- Why are before and after photos so important?